Did Ellen White believe that Jesus is not the LORD God? "But although Christ's glory was for a time veiled and eclipsed by His assuming humanity, yet He did not cease to be God when He became man...The man Christ Jesus was not the Lord God Almighty, yet Christ and the Father are one." The problem of course is that Jesus is the LORD God Almighty. Some SDA defenders have tried to assert that what she meant to say was that Jesus is not the Father, by inserting tropes (i.e. phrases or words) into the text of her statements. (Note: you can make any statement say what you want by using this method!) However, it would be easy to state that Jesus is not the Father! But that is not what she said. But these are the kind of statements that Ellen G. White made all of the time. She was particularly "gifted" at making conflicting and contradicting statements. To say that "Jesus is not the Lord God Almighty " and then to say that "Christ and the Father are one" is conflicting and contradictory. Therefore God has highly exalted him and bestowed on him a the name that is above every name, so that at the name of Jesus every knee should bow, in heaven and on earth and under the earth, and every tongue confess that Jesus Christ is Lord, to the glory of God the Father. It becomes obvious from the above passages that Jesus is Jehovah, and the Lord, the Lord God, and the Lord God Almighty. So who did E.G.W. believe Jesus was in fact? "Michael, or Christ, with the angels that buried Moses, came down from Heaven, after he had remained in the grave a short time, and resurrected him, and took him to Heaven." From these quotes it becomes increasingly clear that Ellen G. White believed that Jesus was really the angel Michael. From the last quote, it appears that she is also confirming again that she does not believe that Jesus is the Lord, by saying, "Christ meekly referred him to his Father, saying, "The Lord rebuke thee." She does not see Christ as the Lord. She sees the Father as Lord, but not Jesus! 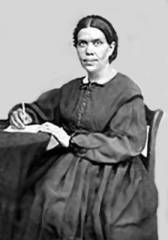 While it may be hard to know exactly what was in the mind of Ellen G. White when making these statements, she is making a good case for herself that she did not believe that Jesus was the Lord God. To not believe that Jesus is the Lord God, is to have faith that is void and in vain, and ultimately to be damned. Jesus said that, "Unless you believe that I AM, you will die in your sins" (Jn.8:24). To not believe that Jesus is the Lord God is to not have a mediator who is both "God and man", which is what sinners need. If Jesus is not both of these, there cannot be any reconciliation between God and man. Do you really want to follow a prophet who teaches such things?